Rear spring suspensions with responsive shock absorbers and anti-sway bars provide nimble, stable handling from a foundation of the rigid frame that delivers a smooth, stable and secure ride for driver and cargo. Minimize cargo shifts on uneven road surfaces. 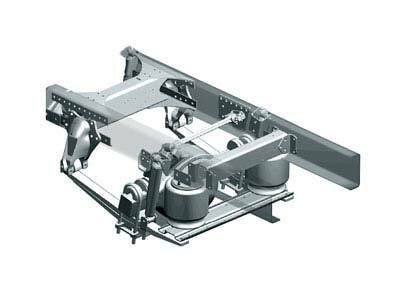 Durable and dependable, FCCC’s flat- or taper-leaf spring rear suspension with sway bar allow for reduced downtime and repair, with increased GAWR for greater payload capacity. For greater comfort and better handling and protection for the load, take a look at our exclusive Airliner® Air Ride suspension. 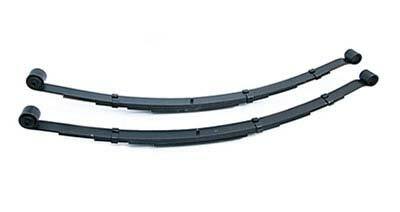 Heavy-duty flat-leaf spring 8,000, 10,000, 12,000 or 13,000 lb. Taper-leaf spring 15,000 lb., 17,500 lb. or 20,000 lb. Airliner® Air Ride 18,000-20,000 lb. 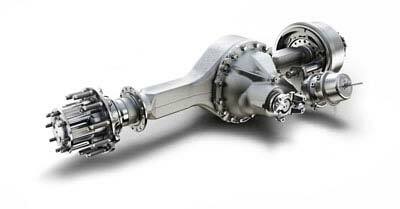 Backed by many years of manufacturing expertise, Detroit™ axles provide market-leading performance and value. An integrated one-piece differential in these rear axles offer greater stability and durability, with a smaller ring gear size for reduced weight and higher payload. Precision cut gears allow for a quieter axle and better gear mesh for driving comfort and durability. Airliner® Air Ride's ingenious, no-maintenance design saves weight and operating costs while superbly cushioning you, your vehicle and your load. Compared to steel suspensions, the AirLiner delivers greater comfort and, consequently, provides better handling and protection for the load. Because the AirLiner suspension systems has substantially fewer parts than competing systems, they offer greater reliability and need less servicing attention in the long run. They require no lubrication, which means little or no routine maintenance. Resale price comparisons prove that trucks equipped with air ride suspensions command a higher resale value versus trucks equipped with standard spring suspensions. AirLiner’s proven combination of trailing arm leaf springs and self-leveling, rolling-lobe air bags provides a uniformly soft spring ride, smoothing the ridges and filling the ruts like only a premium air suspension can. The AirLiner is also designed to reduce sway when turning or negotiating curves, further providing superb ride and handling. Elastomer bushings that insulate your profit margin. Elastomer bushings ensure that the metal parts of the AirLiner suspension won’t rub together, resulting in longer product life. And since there’s no wear surface to lubricate or replace, the AirLiner performance is never compromised—leading to a continued comfortable ride and a very comfortable bottom line. A height-control valve that keeps drivelines in line. To produce the relatively constant spring rate necessary for optimum cushioning performance, an air ride suspension must maintain a relatively constant ride height. AirLiner utilizes a premium rotary valve to fulfill this height-control function. Why a rotary-type valve? Because the efficiency of a conventional, rubber-seat valve can deteriorate with age, altering not only the spring rate but also the driveline angle, possibly shortening the driveshaft life. Suspensions that aren’t afraid of the scale. AirLiner air ride suspensions are lightweight champions. These suspensions are naturally lean because there are fewer parts to begin with. And they feature aluminum brackets on all but the 23,000-lb. models.